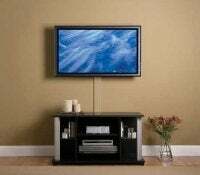 Do You Wall or Table Mount Your Flat TV? You following this Monster Cable debate we've been having? They showed us some tested differences between their cables and the cheap stuff. One issue I have with the test is that they used 10-meter long HDMI cables. Of course that's going to dramatically increase the differences between high-end and low-end cables. And of course, I don't know a single person that uses a cable that length unless wall mounting; and wall mounting, in my experience, is rare. Many average tech geeks just don't use these. Before I go to Monster HQ and match cheap cables vs their high end cables, help me do a fact check on my gut feeling. And while we're asking, what about your cables?